American orbital launch vehicle. 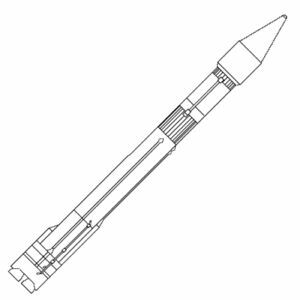 The Atlas IIIA was a development of the Atlas using Russian engines in place of the Rocketdyne MA-5 booster/sustainer group used on all previous models. It was the centerpiece of Lockheed Martin's strategy to remain a leader in the commercial launch services industry. However customers never materialized, and it was used for only two launches in 2002-2004 before being replaced by the Atlas V.
AKA: Atlas IIAR;Atlas IIIA;Atlas IIR. Status: Retired 2004. First Launch: 2000-05-24. Last Launch: 2004-03-13. Number: 2 . Payload: 8,640 kg (19,040 lb). Thrust: 2,600.00 kN (584,500 lbf). Gross mass: 214,338 kg (472,534 lb). Height: 52.80 m (173.20 ft). Diameter: 3.05 m (10.00 ft). Apogee: 40,000 km (24,000 mi). The first stage coupled the unique Atlas balloon tanks and high performance Glushko engines. In a typical Atlas IIIA launch, the vehicle's two RD-180 thrust chambers were ignited shortly before liftoff. Pre-programmed engine thrust settings were used during booster ascent to minimize vehicle loads by throttling back during peak transonic loads in the high dynamic pressure region while otherwise maximizing vehicle performance. Just over two minutes into flight, as the vehicle reached an axial acceleration of 4 g's, the engines began to throttle back, eventually initiating a constant throttle rate to sustain acceleration at 5.5 g's. Booster engine cutoff occurred approximately three minutes into flight and was followed by separation of Centaur from Atlas. The first Centaur burn lasted about nine minutes after which the Centaur and its payload coasted in a parking orbit. During the first burn, approximately ten seconds after ignition, the payload fairing was jettisoned. The second Centaur ignition occurred about 23 minutes into the flight, continued for about three minutes, and was followed several minutes later by the separation of the spacecraft from Centaur. Major suppliers included: NPO Energomash / Pratt & Whitney - Atlas RD-180 engines; Pratt & Whitney - Centaur engines; Honeywell - Inertial Navigation Unit; BF Goodrich - Digital acquisition system; SAAB - Payload Separation Systems. LEO Payload: 8,640 kg (19,040 lb). Payload: 4,055 kg (8,939 lb) to a GTO. Development Cost $: 300.000 million. Launch Price $: 105.000 million in 1999 dollars in 1995 dollars. Stage 1. 1 x Atlas IIIA. Gross Mass: 195,628 kg (431,285 lb). Empty Mass: 13,725 kg (30,258 lb). Thrust (vac): 4,148.722 kN (932,670 lbf). Isp: 337 sec. Burn time: 132 sec. Isp(sl): 311 sec. Diameter: 3.05 m (10.00 ft). Span: 3.05 m (10.00 ft). Length: 29.00 m (95.00 ft). Propellants: Lox/Kerosene. No Engines: 1. Engine: RD-180. Status: In production. Atlas booster and sustainer engine arrangement replaced by Glushko engines developed for Zenit. Not capable of single stage to single stage to orbit capability (an Internet spaceflight urban myth). The single-stage Atlas IIIA booster uses a high-performance RD-180 propulsion system produced by a U.S./Russian joint venture (RD AMROSS) comprised of Pratt & Whitney (U.S.) and NPO Energomash (Russia). The RD-180 burns liquid oxygen and RP-1 propellant and develops a lift-off (sea-level) thrust of 2.6 MN. The RD-180 throttles to various levels during atmospheric ascent to effectively manage the air-loads experienced by the vehicle enabling minimum Atlas vehicle and launch site infrastructure changes. Additionally, throttling results in satellite experienced flight environments that are nearly identical to Atlas IIAS. Stage 2. 1 x Centaur IIIA. Gross Mass: 18,710 kg (41,240 lb). Empty Mass: 1,905 kg (4,199 lb). Thrust (vac): 99.155 kN (22,291 lbf). Isp: 451 sec. Burn time: 738 sec. Diameter: 3.05 m (10.00 ft). Span: 3.05 m (10.00 ft). Length: 10.00 m (32.00 ft). 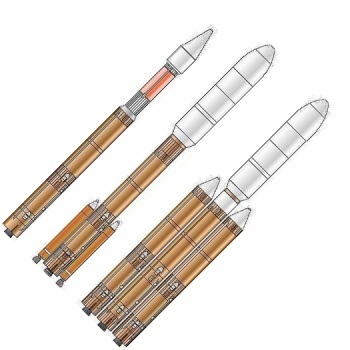 Propellants: Lox/LH2. No Engines: 1. Engine: RL-10A-4-1. Status: In production. Single-engine Centaur for Atlas IIIA. The Lockheed Martin manufactured Centaur IIIA upper stage is powered by one Pratt & Whitney RL10A-4-1 turbopump-fed engine burning liquid oxygen and liquid hydrogen. Using the proven flight design of the Centaur IIAS stage, the only changes to Centaur for IIIA are in the aft region of the stage. For Centaur IIIA, one of Centaur IIAS's two RL10 engines is removed. The remaining engine is re-positioned to a center-mount, and electro-mechanical thrust vector control actuators replace the hydraulically actuated system previously in use. Guidance, tank pressurization, and propellant usage controls for both Atlas and Centaur phases are provided by the inertial navigation unit (INU) located on the forward equipment module. The first Centaur burn lasts about nine minutes after which the Centaur and its payload coast in a parking orbit. During the first burn, approximately ten seconds after ignition, the payload fairing is jettisoned. The second Centaur ignition occurs about 23 minutes into the flight, continues for about three minutes, and is followed several minutes later by the separation of the spacecraft from Centaur. Family: orbital launch vehicle. Country: USA. 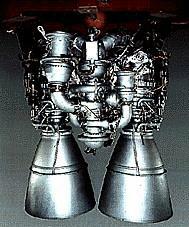 Engines: RD-180, RL-10A-4-1. Spacecraft: FS-1300, Spacebus 3000. Projects: Eutelsat. Launch Sites: Cape Canaveral, Cape Canaveral LC36B. Stages: Centaur IIIA, Atlas IIIA. Agency: Martin. 2000 May 24 - . 23:10 GMT - . Launch Site: Cape Canaveral. Launch Complex: Cape Canaveral LC36B. Launch Pad: SLC36B. LV Family: Atlas. Launch Vehicle: Atlas 3A. Eutelsat W4 - . Payload: Spacebus 3000B2. Mass: 3,190 kg (7,030 lb). Nation: Europe. Agency: Eutelsat. Manufacturer: Cannes. Program: Eutelsat. Class: Communications. Type: Civilian communications satellite. Spacecraft: Spacebus 3000. USAF Sat Cat: 26369 . COSPAR: 2000-028A. Apogee: 35,804 km (22,247 mi). Perigee: 35,770 km (22,220 mi). Inclination: 0.10 deg. Period: 1,436.10 min. Communications satellite. Maiden flight of Atlas IIIA with Russian RD-180 main engine; scrubbed four times. European Telecommunications Satellite Organization (Eutelsat) satellite equipped with 32 Ku-band transponders, and antennae covering Russia and Africa. It will be stationed at 36 deg E. This was the third of the high power Eutelsat W series to be launched (W1 was destroyed in a ground accident). Stationed at 36 deg E. Positioned in geosynchronous orbit at 32 deg E in 2000. As of 4 September 2001 located at 35.98 deg E drifting at 0.003 deg E per day. As of 2007 Mar 9 located at 36.08E drifting at 0.005E degrees per day. 2004 March 13 - . 05:40 GMT - . Launch Site: Cape Canaveral. Launch Complex: Cape Canaveral LC36B. Launch Pad: SLC36B. LV Family: Atlas. Launch Vehicle: Atlas 3A. MBSAT - . Mass: 4,143 kg (9,133 lb). Nation: Japan. Agency: MBC. Manufacturer: Palo Alto. Class: Communications. Type: Civilian communications satellite. Spacecraft: FS-1300. USAF Sat Cat: 28184 . COSPAR: 2004-007A. Apogee: 35,795 km (22,241 mi). Perigee: 35,779 km (22,231 mi). Inclination: 0.00 deg. Period: 1,436.10 min. Mobile S-band digital broadcasting services for home and automobile users in Japan. As of 2007 Mar 9 located at 144.03E drifting at 0.009W degrees per day..